JPMorgan Chase CEO Jamie Dimon says bitcoin"is a fraud." she thinks she's a genius." In an appearance at a separate conference earlier in the day organized by Barclays, Dimon said bitcoin mania is reminiscent of the tulip bulb craze in the 17th century. "It's worse than tulip bulbs. It won't end well. 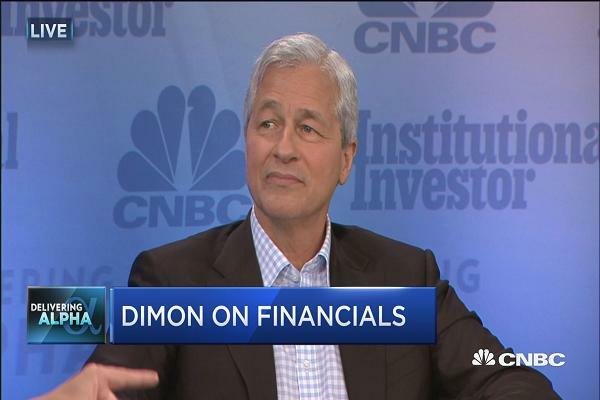 Someone is going to get killed," Dimon said at a banking industry conference. "Currencies have legal support. It will blow up." Dimon also said he'd "fire in a second"any JPMorgan trader who was trading bitcoin, noting two reasons: "It's against our rules and they are stupid." “Honestly, I am just shocked that anyone can’t see it for what it is,” he said. The question with bitcoin is always, do you think it has a value as a currency? Is the price at its current point justified by its everyday use, or is the demand purely speculative? I looked at an SP chart, and it lags few months, but the rise in the stock exchange closely mirrors the rise in bitcoin, not in percentage terms but in movement and direction. The difference is that some of these stocks may actually have a value, whereas bitcoin seems almost entirely speculative at this point. A little anecdote. I asked my friend in IT about bitcoin six months ago to see if he knew how to purchase it because I was considering using it as a transfer mechanism. He said he only knew that it existed. Flash forward five months, and he and everyone I know is buying bitcoins, thinking of mining bitcoin (ultimately decided against it) and an entrepreneur I know who also knew nothing about bitcoin a short time ago has even created a bitcoin wallet and wants to create his own currency. I even saw a car with the license plate "bitcoin 1". This sucker is a bubble. Ok idiot, money is the bubble that never bursts. So he classifies bitcoin as "fraud" in comparison to his beloved fiat currency which he says has "legal support." No explicit recognition that the legally supported currency erodes in value pretty much continuously through his sector's crony relationship with the Fed (in fact, Block, Hoppe, et al characterize the use of fiduciary media in the banking system as an instance of fraud). What he really means is that alternatives to the dollar are competitive threats to his business model. Whether or not bitcoin becomes money is besides the point; I'm sure Dimon would have equally nice things to say about the barbarous metal. Exactly. He's not fooling anyone. If Bitcoin were really so worthless, he'd have no reason to come out so strong against it. Money represents the final settlement of a transaction, among other things, of course. When someone sells a good for bitcoins at the current exchange rate (minus costs, etc.) and then turns around and exchanges bitcoins for dollars. the dollar is the currency, not the bitcoin. Until factors of production are priced in bitcoins, it is false to call bitcoin a currency. In other words, Hippy Teas sells its flavored tea in either dollars or bitcoins. But it always uses the dollar-to-bitcoin exchange rate to set the bitcoin price. And, in order to buy replace its teas, sugars, cups, etc., Hippy Teas has to pay in dollars, bitcoin is just a fun diversion. Not a currency. There are 800+ "currencies", not all of which are suppose to act for settling of transactions. Some are equivalent to shares in a new business. In order to buy any of these 800+ currencies you need to use Bitcoin or Ethereum. Does this not make Bitcoin a currency? Perhaps the reserve currency of the future? Nothing is priced independently in bitcoins. In other words, the latte priced in bitcoins changes with the dollar-to-bitcoin market. The price does not change due to a Cantillon effect, it changes to the real underlying currency (which remains the dollar in the Seattle cafe). In essence, bitcoin is the opposite of a reserve currency. If in Bitcoin world, cyberspace, these coins and the platforms/services offered for exchange (the latte) require a bitcoin, how is bitcoin not the reserve currency in cyberspace. I realize you have to come back to earth to consume the latte, but all these coin offerings create a real demand for bitcoins, people want to hold/use them, yes they will want dollars at some point, for now. But people get euros when in europe and then come back to dollars, because they are commonly accepted. I'm curious as to how long people will want to hold bitcoins and if prices become independent. I do not know anyone who is paid in bitcoins in the US where their salary is not tied to the dollar. In other words, when Hippy Teas opened (say) three years ago and they agreed to pay 1 bitcoin per eight hour day. I am certain they are no longer paying that wage. Bitcoins are a fun diversion. And some folks have made (and recently lost) a lot of money trading them. But the same is true with stamps, metalic coins, etc. When factors of production are priced in bitcoins, and prices independently set in bitcoins, the status of bitcoins will change. However, I do not see that happening for various reasons. Idiot, just because you do not know anyone doesn't mean they don't exist. "when factors of production are priced in ...." idiot, no one defines money that way except you.